To begin practice of the Way of Adidam is to take full advantage of the opportunity offered by Adi Da Samraj — it is to enter fully into the process of Divine Enlightenment. That process is a unique ordeal, which necessarily requires application to the wide range of functional, practical, relational, and cultural disciplines that Avatar Adi Da Samraj has given for the sake of that Divine Process. If you are interested in becoming a formal practitioner of Adidam, please contact the Adidam community nearest you. 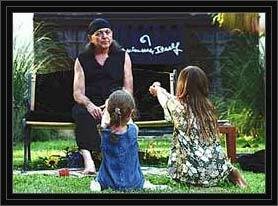 Young people (under 21) are also offered a special form of relationship to Avatar Adi Da: the Adidam Youth Fellowship. The Adidam Youth Fellowship has two membership bodies — friends and practicing members. A friend of the Adidam Youth Fellowship is invited into a culture of other young people who want to learn more about Adi Da and His Offering. A formally practicing member of the Adidam Youth Fellowship acknowledges that he or she has found his or her True Heart-Friend and Spiritual Teacher in the Person of Adi Da Samraj, and wishes to enter into a direct, self-surrendering Spiritual relationship with Him as the Means to True Happiness. Practicing members of the Youth Fellowship embrace a series of disciplines that are similar to (but simpler than) the practices engaged by adult members of the second congregation of Adidam. Both friends and members are invited to special retreat events from time to time, where they can associate with other younger devotees of Adi Da Samraj.